Hello everyone! Another month has gone by...I'm talking about July even though here it looks more like November! I really hope summer will decide to show up at some point but with no further ado let's jump right into my July favourites! I'm obsessed with Liberty's rose and lemond rind body lotion! It smells like a dream, very fresh and zesty. The texture is light and absorbs so quickly leaving a lovely scent behind. Plus the bottle is huge and the pump is really convenient. 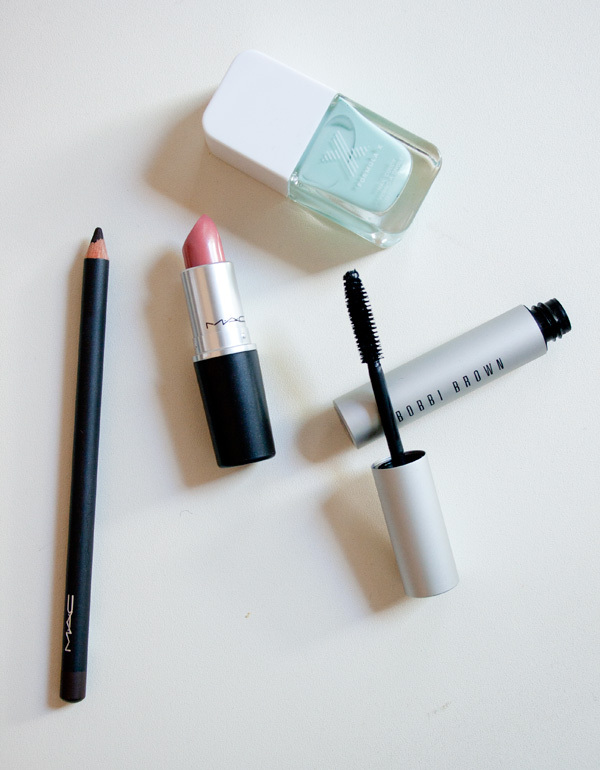 This month I started using a new mascara: Bobbi Brown smokey eye mascara. I love it, it has a nice brush that really separates your lashes. The final look is natural and very pretty! For my eyes I'd been loving Mac eye pencil in Coffee, a dark brown. It's nice to use instead of black and it blends quite easily creating a cool, smokey effect. For lips my favourite product was again from Mac, I'm talking about Peach Blossom! It's a cremesheen, so it's quite sheer but gives your lips a lovely peachy tint that I really like! As you can see I got my first Formula X nail polish. These are so rave about online and I was curious to see if they were really so amazing. I picked out a minty shade called Unmistakable and it's so pretty!! It's quite long lasting and even though I'm not blown away I like these nail polishes and I'm curious to try more from this range! 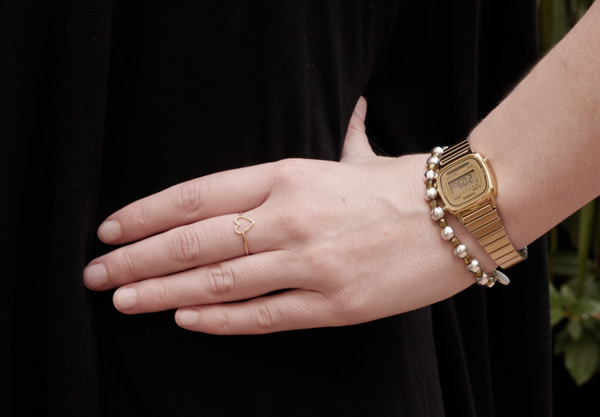 This month I've been obsessed with midi rings! I think they're very cute and frame your hand really nicely. Those in the picture are from H&M and Brandy Melville. 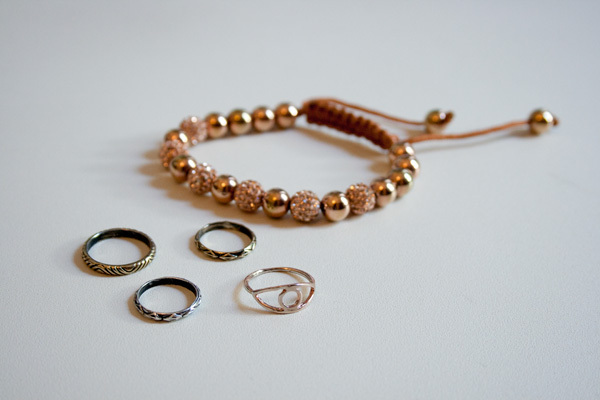 I also love pairing my midi rings with a rose gold beaded bracelet found in Bruges! 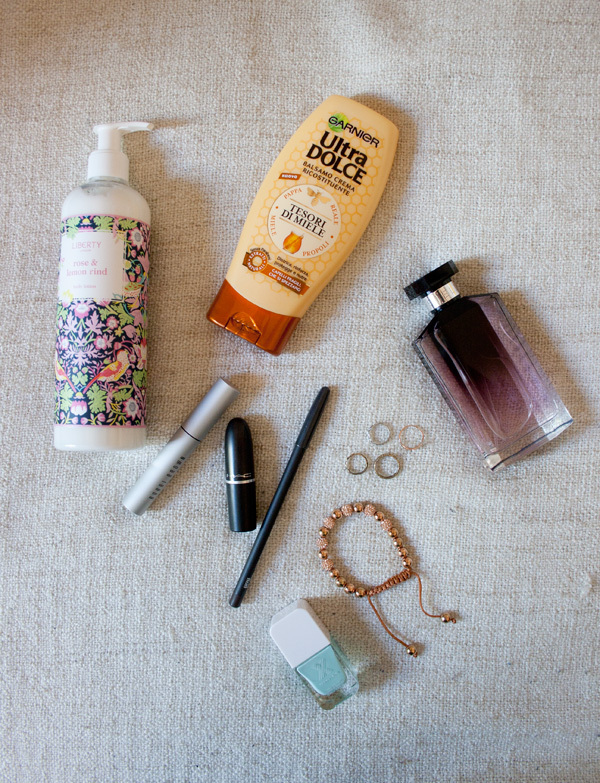 So these were my July favourites! I hope you like them and if you feel like so, share with me you're favourites of the month! Have a beautiful day! Ciao a tutti! Un altro mese è finito...e sì sto parlando di Luglio, anche se da quese parti sembra più Novembre! Spero davvero che l'estate decida di farsi viva prima o poi! Ma senza ulteriore indugio, andiamo a scoprire quali sono stati i miei prodotti preferti del mese! Sono fissata con la crema per il corpo rose and lemond rind di Liberty! Ha un profumo buonissimo, è fresca e sa di agrumi. La consistenza è leggerissima, infatti si assorbe davvero in fretta, lasciando sulla pelle il suo delizioso profumo. Inoltre la confezione è enorme e il dispensatore è comodissimo. Questo mese ho iniziato ad usare un nuovo mascara, il Bobbi Brown smokey eye mascara. Lo adoro, l'applicatore separa le ciglia e le fa apparire più lunghe. Il risultato finale a mio avviso è carinissimo e molto naturale! Per gli occhi ho usato molto la matita di Mac nel colore Coffee, un marrone scuro. È un'ottima alternativa al nero e si sfuma benissimo, quindi è perfetta per creare un leggero effetto smokey. Per le labbra il mio rossetto preferito, è un altro prodotto Mac e si tratta di Peach Blossom! Appartiene alla linea cremesheen, quindi non è troppo intenso ma dona alle labbra una deliziosa tinta sul pesca! Come potete vedere ho preso il mio primo smalto della line Formula X, uscita di recente anche da Sephora in Italia (e online). Dopo averne sentito parlare benissimo sul web, ero davvero curiosa di provarli per vedere cosa avessero di così speciale questi smalti. Il colore che ho scelto si chiama Unmistakable, ed è un bellissimo verde menta. Il vero pregio di questi smalti (o almeno di questo che ho provato) è che durano molto, senza scheggiarsi. Niente di trascendentale, ma sono carini e ci sono moltissimi colori, quindi penso che prima poi allargherò la mia collezione! Questo mese la mia fissa sono stati i midi rings! Li trovo carinissimi e un ottimo modo di impreziosire le mani. Quelli nella foto sono di H&M e Brandy Melville. Li ho abbinati al mio bracciale preferito trovato a Bruges! Questi erano i miei preferiti di Luglio! Spero che il post vi sia piaciuto e se vi va, fatemi sapere quali sono stati i vostri preferiti del mese! Vi auguro una splendida giornata! A few weeks ago I saw this top on a very pretty girl but I was too shy to ask her where she got it from...so I started hunting for it and eventually I managed to spot it, on sale (oh yes!) at Zara. I really love it, I find that is one of those structured pieces that makes the most boring outfit looks cool :) The fabric is thick but not heavy and the print is very chic and versatile. I can see myself wearing this over a pair of black skinny jeans, as well as a mini skirt or a pair of shorts. Do you like it? Qualche settimana fa, ho visto questo top indosso a una ragazza, ma mi sono vergognata a fermala per chiederle dove l'avesse preso...quindi ho iniziato la mia ricerca per ritrovarlo. Alla fine ce l'ho fatta e l'ho trovato in sconto (evvai!) da Zara. Mi piace moltissimo e lo trovo uno di quei capi strutturati, che rendono speciale anche il più semplice dei look :) Il materiale di cui è fatto è spesso, ma non pesante e la stampa è molto chic e versatile. Si abbina benissimo a un paio di skinny jeans neri, così come a una mini gonna o a un paio di shorts. A voi piace? This morning my friend Andrea (who apparently knows me really well) sent me a picture of these cuteness and of course the link where I can get my hands on them (if you're interested click Here). I love Ladurée and I love Sonny Angels so I think this collaboration is something I just can't pass! I mean look how cute they are!! Stamani il mio amico Andrea (che diciamo mi conosce molto bene), mi ha mandato la foto che vedete qui sopra, insieme ovvimente al link dovre avrei potuto acquistarli (se siete interessati cliccate Qui). Adoro Ladurée a anche i Sonny Angels, quindi questa collaborazione non posso proprio lasciarmela sfuggire!! Non sono carinissimi?! 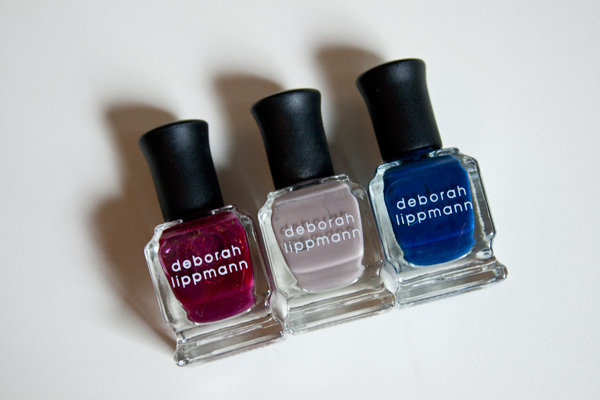 Last week my friend Elisa surprised me with this mini set of Deborah Lippmann nail polishes. 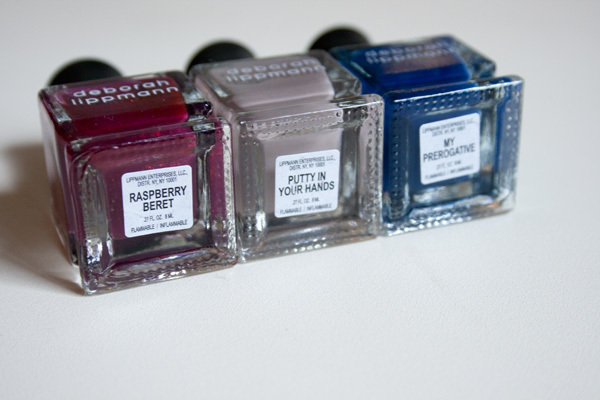 I own a base from Deborah Lippman but I've never tried their nail polishes so I'm really excited! I love all the colors but my favourite is "putty in your hands" the taupy one :)Have you ever tried Deborah Lippmann nail polishes? Do you like them? La scorsa settimana la mia amica Elisa, mi ha fatto un sorpesa, regalandomi questo set di mini smalti di Deborah Lippmann. Ho una base di Deborah Lippmann ma non ho mai provato gli smalti, quindi non vedo l'ora di testarli! I colori mi piacciono tutti, ma il mio preferito è "putty in your hands", quello color taupe :) Voi avete mai provato gli smalti di Deborah Lippmann? Vi piacciono? Hello everyone! How was your weekend? In Florence was boiling hot...but not it's pouring rain! I don't know what it is up with this weather! 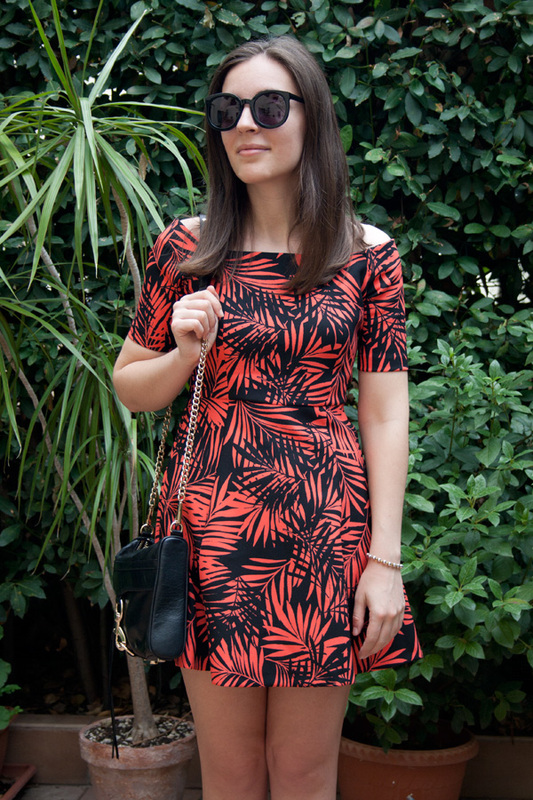 Anyways saturday was very sunny, so I decided to wear my printed dress from Zara that I got in the sales. I really like this dress, I think it's fun and I love the wide neck cut, I think it's very flattering! I paired it with a pair of tennis shoes just because I had to walk a lot that day and I couldn't be bothered wearing something that wasn't mega comfy. It's a very versatile dress, perfect for summer and it will look super cute with heels, flats or sandals. I hope you liked the look and I wish you all an awesome day! Ciao a tutti! Come è andato il fine settimana? A Firenze è stato caldissimo...e ovviamente da stamani non fa altro che piovere! Certo che il clima è davvero impazzito! Ma torniamo a noi, visto che sabato era una bella giornata di sole, ho deciso di indossare il mio abitino stampato, preso ai saldi da Zara. Mi piace un sacco, adoro la stampa e trovo delizioso il taglio ampio del collo! L'ho abbinato a un paio di scarpe da ginnastica solo perchè sapevo che avrei dovuto camminare un sacco, quindi volevo essere sicura di non avere problemi, ma il vestito è davvero versatile e si abbina facilmente ai tacchi, a un paio di ballerine o dei pratici sandali :) Spero che il look vi sia piacciuto e vi auguro buona giornata! I like the look of belts but I've never been a belt person, even though I like to wear them from time to time and believe it or not I didn't own a black belt until I found this! I've been looking for one but I couldn't find anything I like. Then I went to COS and find this all black leather belt which is just right up my alley :) it's basic and the black buckle gives it a very chic look! 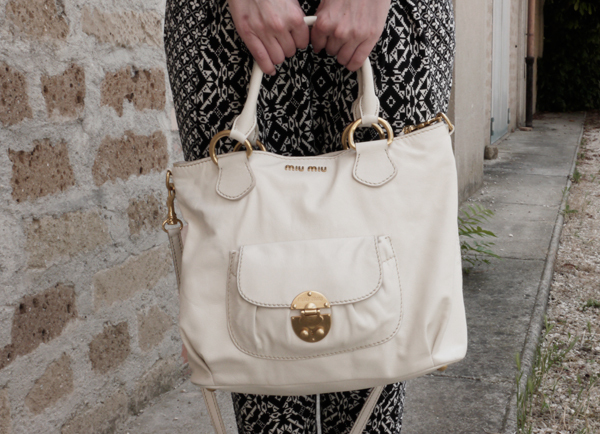 I think it will look great on my beloved jeans or with some black pants. Do you like it? Do you wear belts? Le cinture mi piacciono e anche se non le uso molto spesso, a volte mi piace portarle per rifinire i miei look ma vi confesso che prima di trovare questa, non possedevo una cintura nera! Era da un po' che ne cercavo una, ma non riuscivo a trovare niente che attirasse la mia attenzione. Poi sono stata da COS e ho trovato questa cintura completamente nera ed è stato amore a prima vista :) è molto semplice, ma la fibbia nera a mio avviso, aggiunge un tocco chic! Penso proprio che starà benissimo con i miei amati jeans o con un bel paio di pantaloni neri per un total look. Vi piace? Voi siete amanti delle cinture? Vi auguro una buona giornata! Hello everyone! Yes as you can see I'm on holiday mode...even though I'm not going on holiday till mid August I think...but oh well! I really love straw bags for summer, they have a nice vintage look to me. I like mine to be very classic, like this one from J. Crew :) I need new flip flops and I wouldn't mind these from Hollister, they look cuter than you're average flip flops don't they? Of course I need a swimsuit but for me it's always a challenge to find one that I like and that fits nicely...we'll see what I can find! I hope you liked my wish list :) What's on your lists this month? 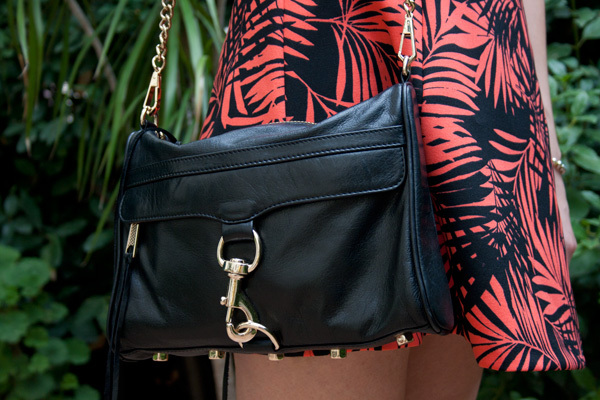 Are you on holiday mode too? Ciao a tutti! Ebbene sì, come vedete la mia mente è in modalità vacanziera...solo la mia mente perchè penso proprio che per andarci davvero in vacanza, dovrò aspettare metà agosto...ma intanto sognamo un po' no?! Amo le borse di paglia in estate, mi piace il loro aspetto vintage e per me, ne sceglierei una molto semplice, proprio come questa di J. Crew :) Ho bisogno di un nuovo paio di ciabattine da mare e queste di Hollister sono proprio carine, non trovate anche voi? Ovviamente poi mi servirebbe un costume, ma trovarne uno che mi piaccia e che mi stia bene per me è sempre una sfida...vedremo cosa riesco a trovare! Spero che la mia wish list vi sia piaciuta! Voi cosa avete messo nelle vostre questo mese? Avete anche voi voglia di vacanze? Hello everyone! I hope you had a fantastic weekend :) mine was very relaxing and consisted of long walks with my boyfriend, nice food and a couple of good movies...and yes I also did some shopping, 'cause you know...it's sales time! 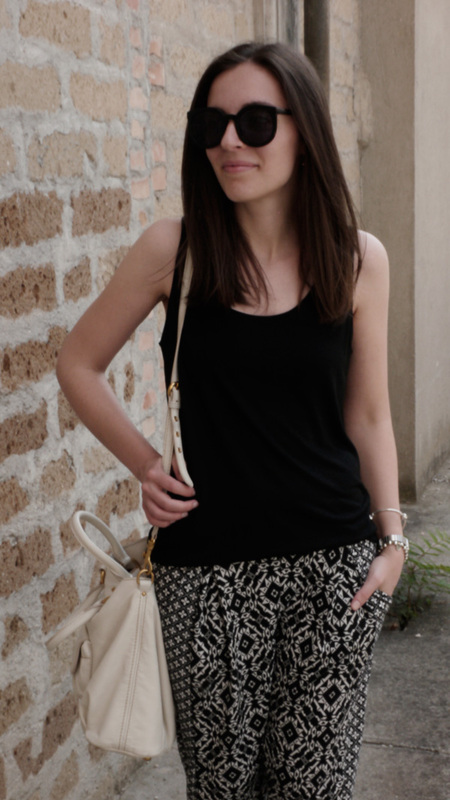 But today I want to show you another one of my Summer looks and as you can see I'm not wearing jeans! What a shocker I know XD When it's hot I think this kind of flowy pants are the best, they're comfortable and still looks cute. 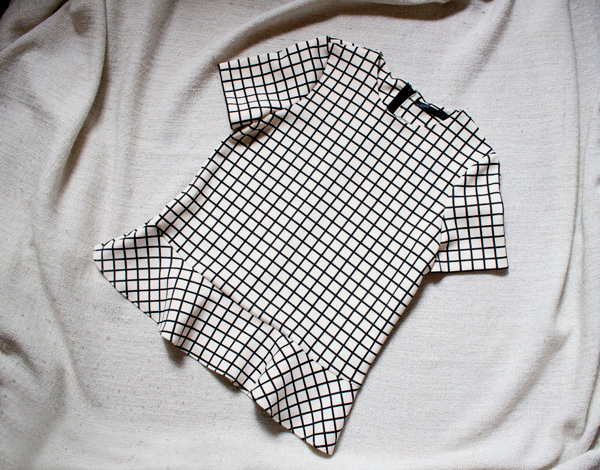 I decided to go for a geometric black and white print but they came in so may different prints and colors! Do you like the look? Have a nice day! Ciao a tutti! Spero che abbiate passato un buon fine settimana :) io devo dire che mi sono proprio rilassata, facendo lunghe passeggiate con il mio ragazzo, gustando del buon cibo e vedendo un paio di film carini...e sì ovviamente ho fatto anche un pochino di shopping, perché beh...lo sapete...è tempo di saldi! Ma torniamo al post di oggi, dove voglio mostrarvi, un altro dei miei look estivi e come potete vedere, per una volta, non indosso i jeans! Non ve lo aspettavate eh XD Quando fa caldo penso che pantaloni come questi siano perfetti per stare freschi, comodi e comunque avere un aspetto carino. Ho scelto una stampa geometrica in bianco e nero, ma se ne trovano davvero di tutti i colori! A voi piace questo look? Buona giornata! Me and my minis! You can never get enough of those, can you? Well the other day I was in Sephora and I saw this mini set from Bumble and Bumble. I've never tried this line before but I heard great things about it so I decided to give it a go! You get a mini Surf shampoo and contioner and a mini Surf spray which is supposed to give you the perfect beach waves look. I'm sooo looking forward to trying them and I'll report back how I like these products. Have you tried them? Have a nice day! Io e le mie mini taglie! Non se hanno mai abbastanza, non pensate anche voi? Beh l'altro giorno ero da Sephora e ho visto questo mini set di Bumble and Bumble che mi chiamava dallo scaffale. Non ho mai provato questa linea ma ho sentito dire che è fantastica, quindi ho deciso di provarla! Nel set trovate un mini Surf shampo, un mini balsamo e un mini Surf spray che promette di regarci bellissime onde, proprio come se fossimo state al mare. Sono curiosissima di provarli e ovviamente vi farò sapere cosa ne penso. Voi li avete provati? Vi auguro una buona giornata!